Larix decidua 'Puli' on its own stem. Chen tells me that you most often see it on a high graft. Do you see the tall, fresh-green conifer in the middle-background of this picture? On the day I visited Garden Canadensis I didn't pay it much attention; the focus of my camera lens fixed solely on the flashier flowers in the foreground. But now, as I looked back at my pictures, I can see how hard it had worked to try to catch my attention; flirting and waving its soft green curls at me, "You-hoo, Mz. picture taker. Over here!" What a shame I didn't pay it any heed, and my images of the curly conifer are all in soft focus! 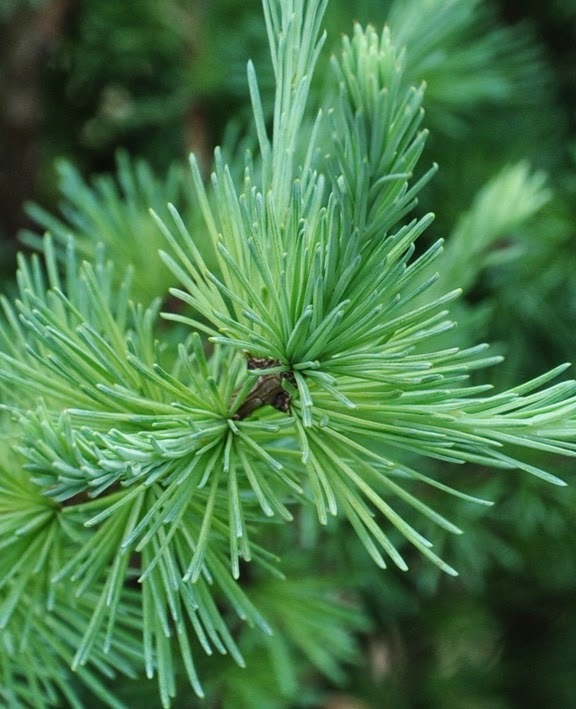 The beauty of conifers is conspicuous as that of flowers. It requires the patience to take a closer look. shoots in spring that contrast nicely with the green foliage." or soft as a feather. 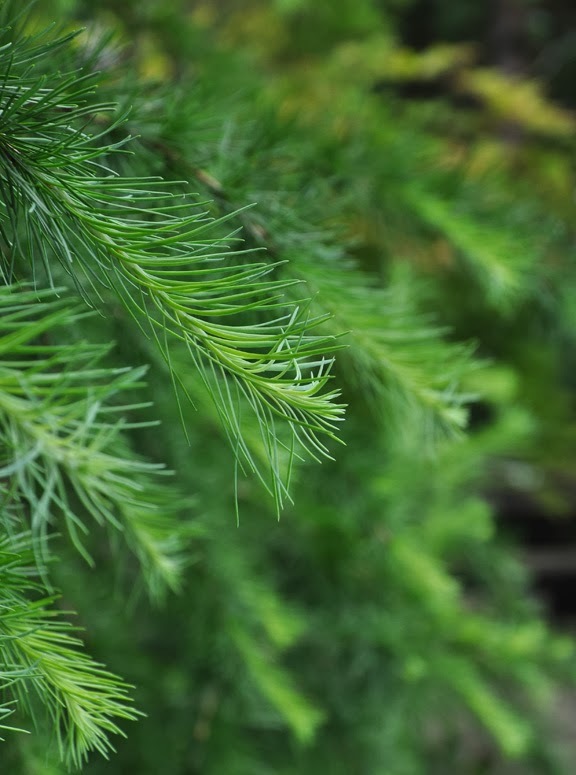 We tend to think of conifers as "green", but that brusque description overlooks the amazing diversity and complexity of their color. 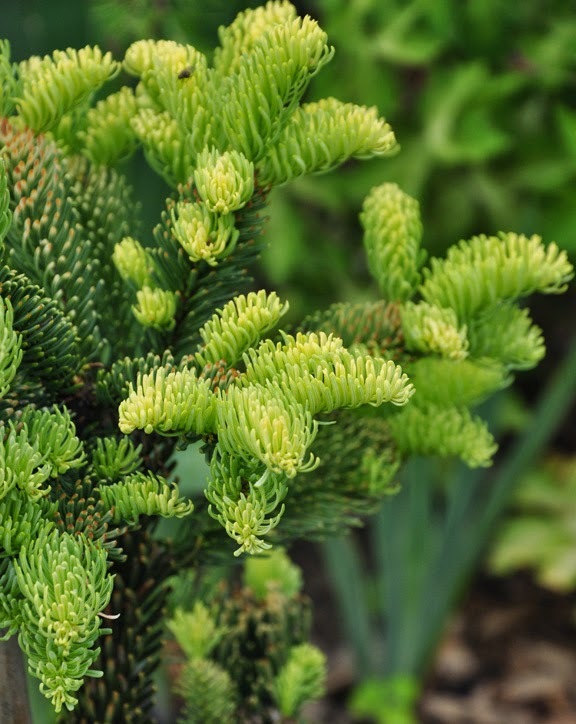 Abies procera 'Sherwoodii' has creamy yellow needles. Fresh growth can sometimes be a lighter, brighter color that contrasts beautifully with the deeper colors of more mature growth. I love the steely blue of this Chamaecyparis pisifera 'True Blue' against the deep, dark Ligularia 'Britt Marie Crawford' on the right. You know when you're a serious plant geek when a color combination like this makes your heart skip a beat. 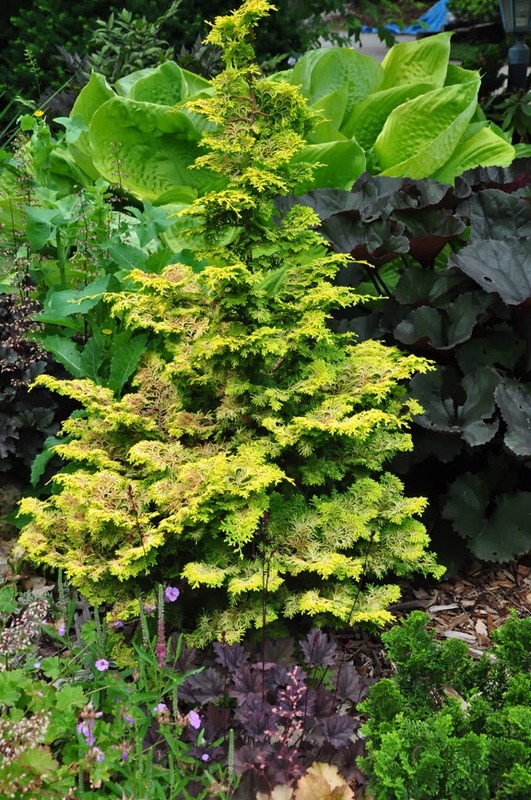 "This is one of the most ornamental conifers in my garden. The beautiful light gold foliage is maintained throughout the growing season. So far my 'Eugene's Gold' is showing no signs of developing the strong leader that will transform it into a compact tree. 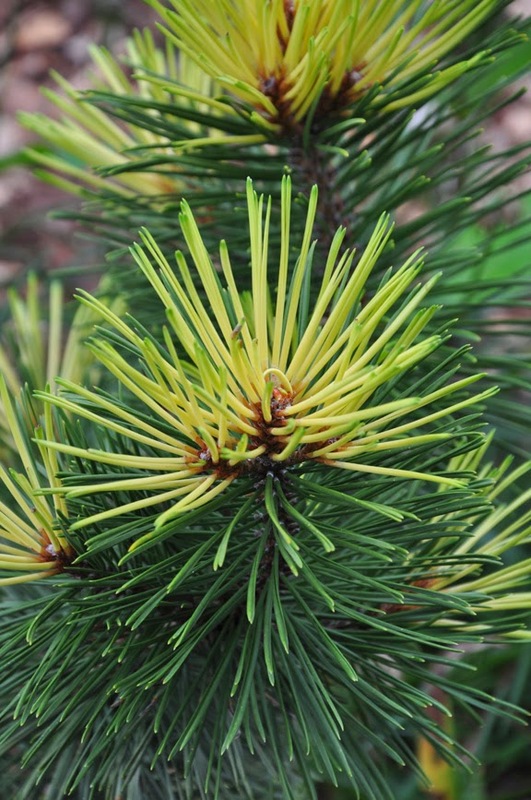 I like its low, spreading habit so I might just leave this as it is and purchase a second Abies balsamea." And look at this absolutely amazing color! 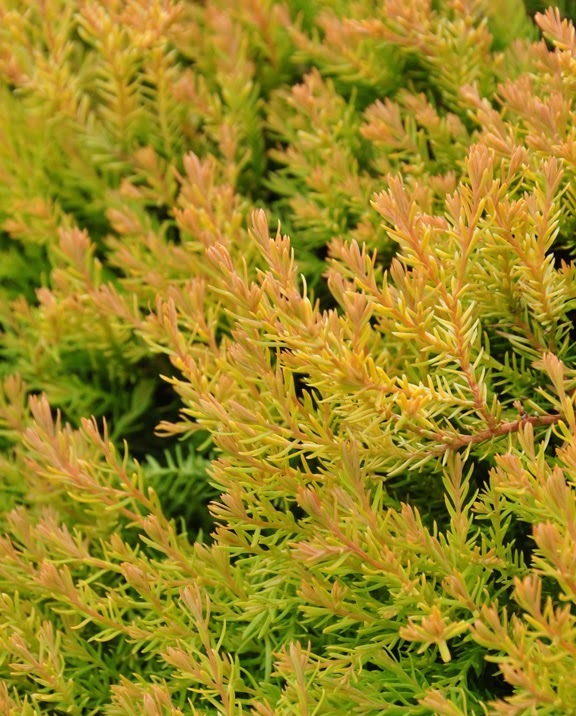 This Thuja occidentalis 'Rheingold' is a blaze with yellow-green and orange. 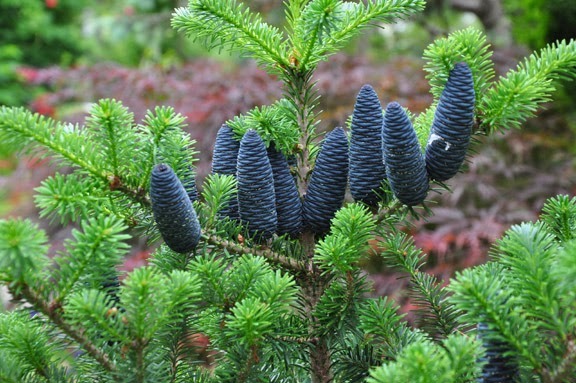 The bluish conifer in the foreground is Larix laricina 'Blue Sparkler'. The yellow one behind is Taxus cuspidata 'Aurea' with Picea mariana in the distant background. 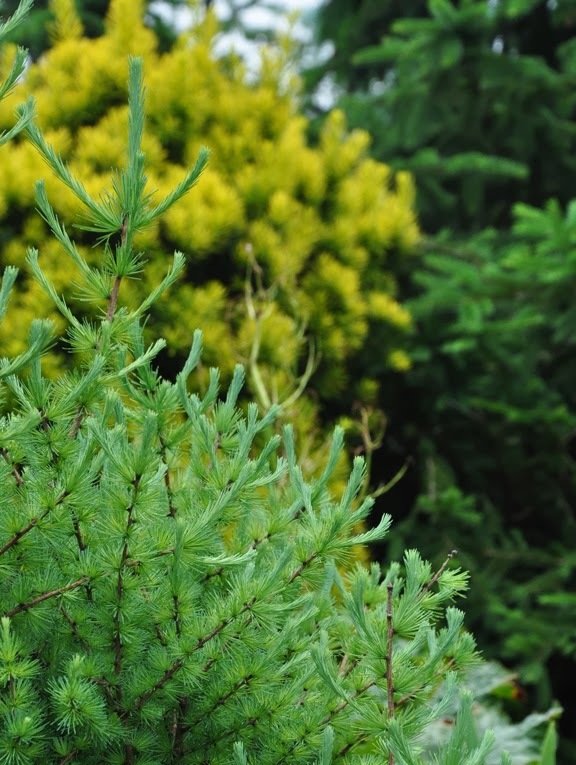 Mix a group of conifers together and you can have a really rich and varied tapestry. Here is a star of a grouping that literally spots traffic. Chen tells me people often pull their cars to the side of the road and come to the front door to ask about this particular False cypress. Picea pungens 'Spring Ghost' on the left. 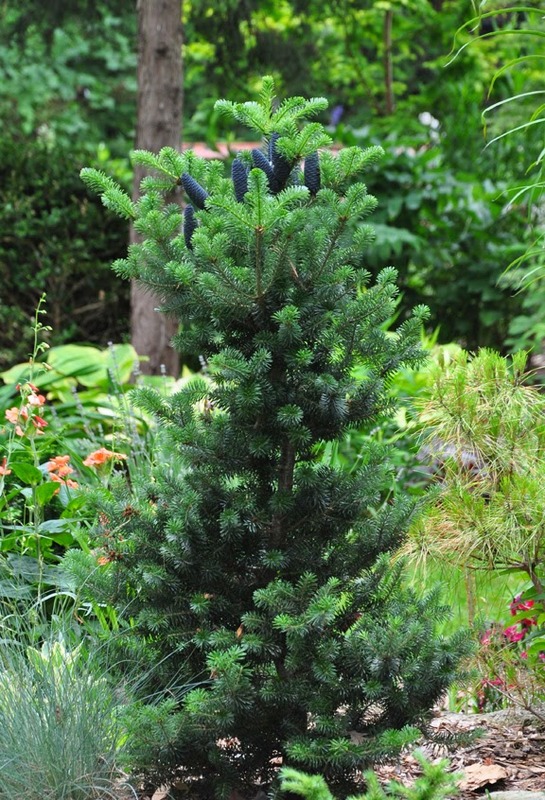 Chen tells me that, "This is one of the most ornamental blue spruce, with creamy white new growth in May/June." On the right is Chamaecyparis obtusa 'Limerick' Chen:"It is one of the most bright golden False cypress." 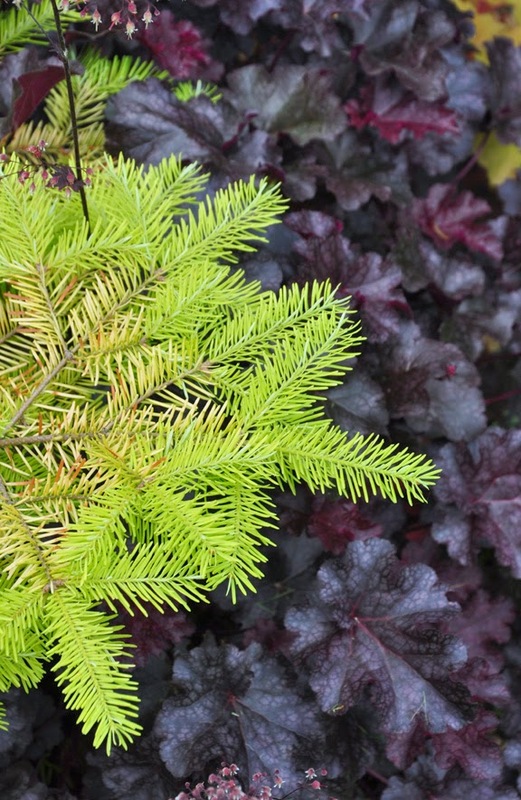 But what I possibly like even more than the color, is the interesting shapes and textures conifers add to the garden. This Larix kaempferi 'Pendula' cascades like water. I know this is getting long. 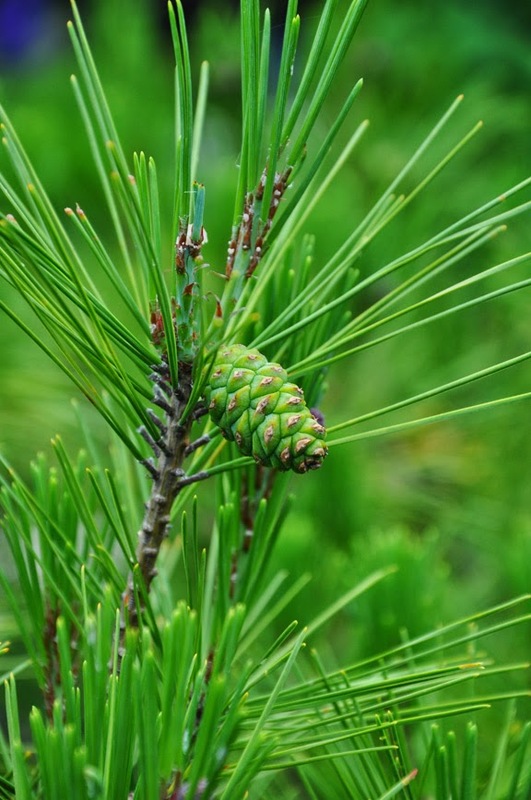 Just one last thing I want to draw to your attention: the cones on a few of Chen's conifers. Here we are a little closer. 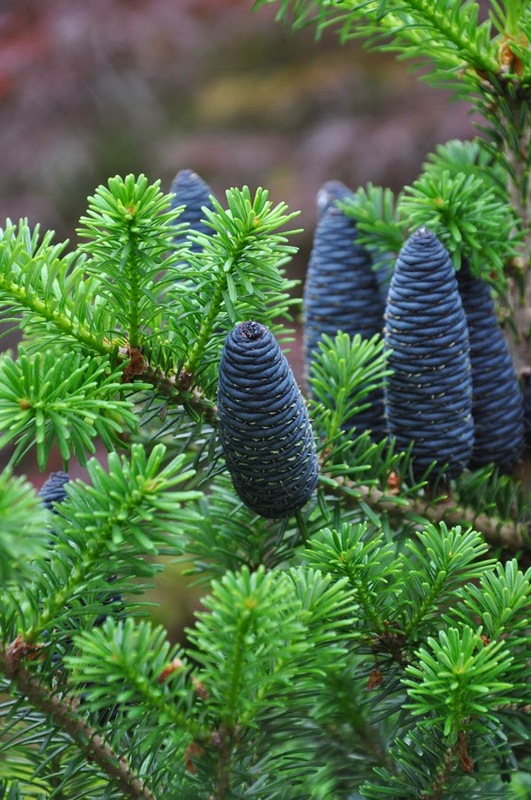 Abies koreana 'Lippetal' is approximately 4' x 2'. I thought these reddish cones were quite intriguing as well. Now, I am sure you must be wondering why, if I am so keen on conifers, there aren't more in my own garden. Well, they are not inexpensive for one. 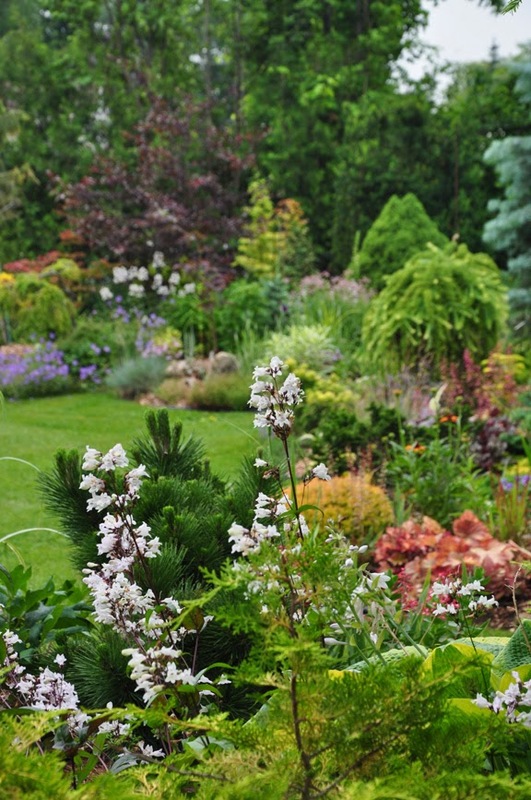 You can often buy two or three perennials for the cost of a single conifer. There is something immediately gratifying about going home with a trunk load of plants rather than a few choice specimens. 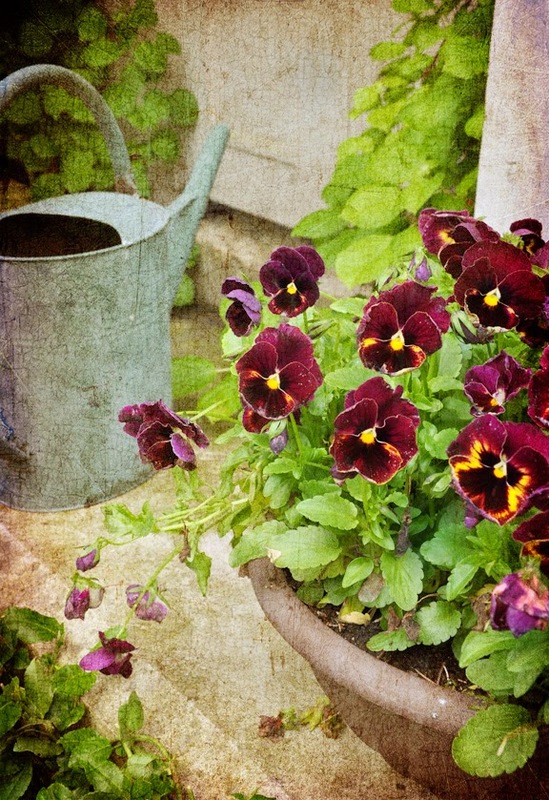 But gardening is one of those pastimes where patience and perseverance reap the greatest return. If I learned anything from visiting Chen's garden, it's the importance of thinking long range. The greater reward is not immediate, it's long term. In conclusion of this series, I want to say a very big thank you to Linda and Chen for allowing me to photograph their private garden. It was such a pleasure to wander around for a couple of hours and take pictures. Chen and Linda, I think your garden is simply incredible! There are newbie bloggers who seems to bolt out of the gate like thoroughbred horses in a race. Three posts a week; regular like clockwork. But blogging doesn't turn out to be what they thought it was or perhaps it is simply more work than they bargained for, because they start to fall back into the pack and then the blog just.... ends. Sometimes you will happen across a blog like this. Abandoned, but still adrift on the rippling waters of the internet. When I think back to my own beginnings for years ago, I was completely clueless. I assumed that all I had to do was combine words with pictures and readers would magically show up just to see if I had something interesting to say. Well, the reality is that I was just one shy voice at a very noisy party. There are zillions of blogs which are decently put together with an average of twenty comments a post and a modest readership. It is pretty difficult to stand out when you just are one of many. Most of that first year of blogging I spent talking to myself like some sort of crazy person. It didn't help that I made every mistake possible. Take the name: Three Dogs in a Garden. Obviously I am not particularly good with titles. I figured our three Shelties were one of the important things that made my garden uniquely my own. And I hoped it was a quirky enough phrase that people might remember it. And that all important goal of three posts a week? Hah! I don't think I ever managed it. Monday blog posts are the hardest and yet probably the most important. But weekends are so busy, who has time to compose a decent Monday post? Tuesday or even Wednesday often have to do. And now what about branding? Everything I have ever read about blogging suggests that you should aim to "brand" your blog. Well, I change my header every few days. For me it is rather like putting on a fresh set of clothes before heading out the door to an important occasion. Finally, I make posts way too long. Oops. This one seems to be no exception. Last week I sailed past my fourth anniversary and it was not without a bit of trepidation. The four year mark seems to be a difficult milestone for many bloggers. Only recently I was startled to find a favourite blogger had suddenly up and quit. Often there are those long silent pauses that serve as a warning, but this was completely unexpected. It felt as if she had packed her bags and slipped away quietly in the night. Fortunately for her fans, she left a short note with a forwarding address. So what to the future of this blog? I will be honest: there isn't a week that passes where I don't question where I am going with all this. The future pretty uncertain. The past, on the other hand, is knowable. Three Dogs in a Garden has brought me so many wonderful and valued friendships. I have learned so much and seen so many wonderful gardens. I am a better writer and photographer for it. I want to close by saying a big thanks to you for being a part of this ongoing journey. 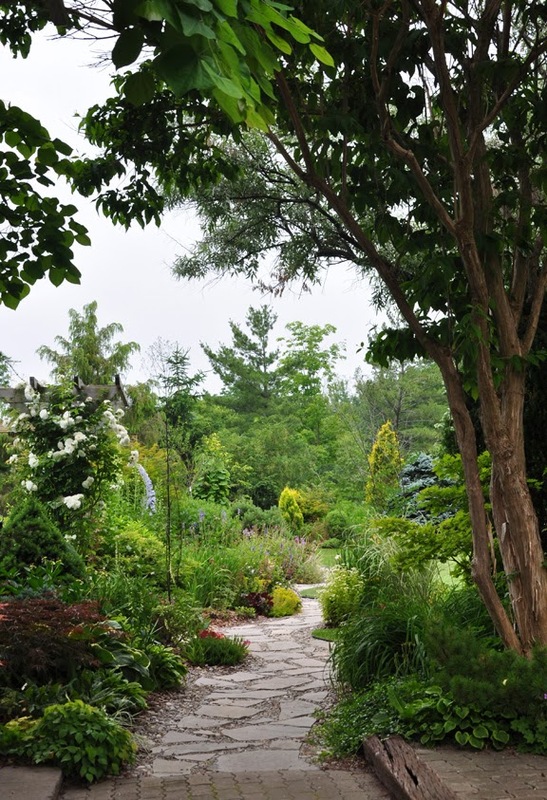 In this, the third in a series of blog posts on Garden Canadensis, Chen and Linda's country garden located near Milton, Ontario, we will take a look at interesting perennials and plant pairings for sun and part shade. 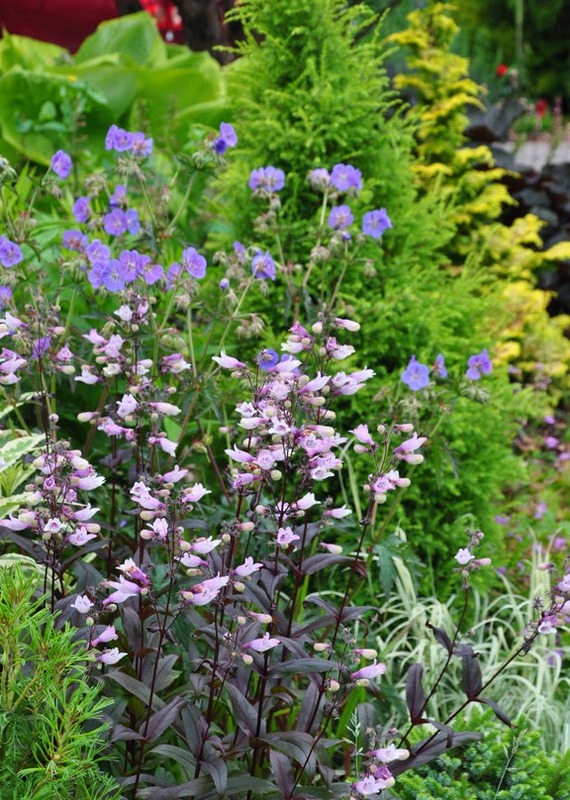 Planting Combination: Penstemon 'Dark Towers' and Geranium 'Rozanne' and Lavender, Lavandula. 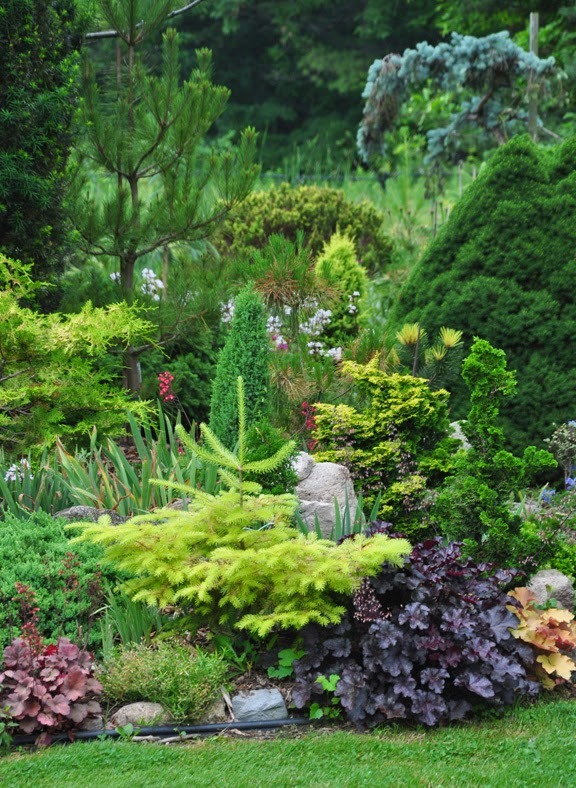 Why this works: Though I am focusing in on the flowers at the moment, I want to take a second and point out the valuable role that the conifers play in this grouping. 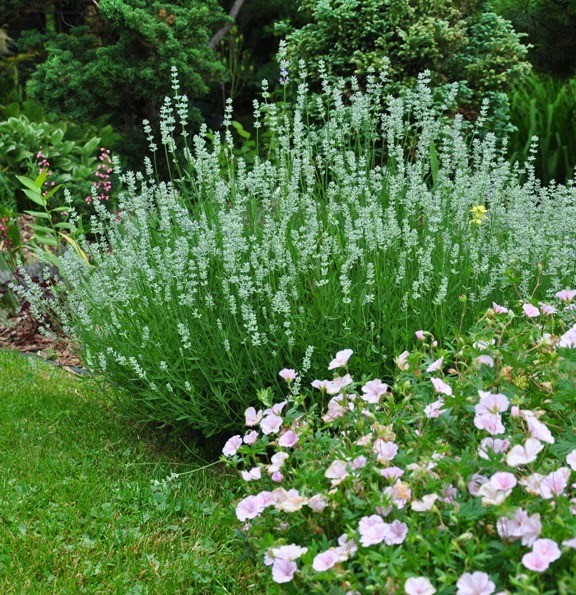 The blooms in this combination of plants are dainty and their stems are fine and wispy. 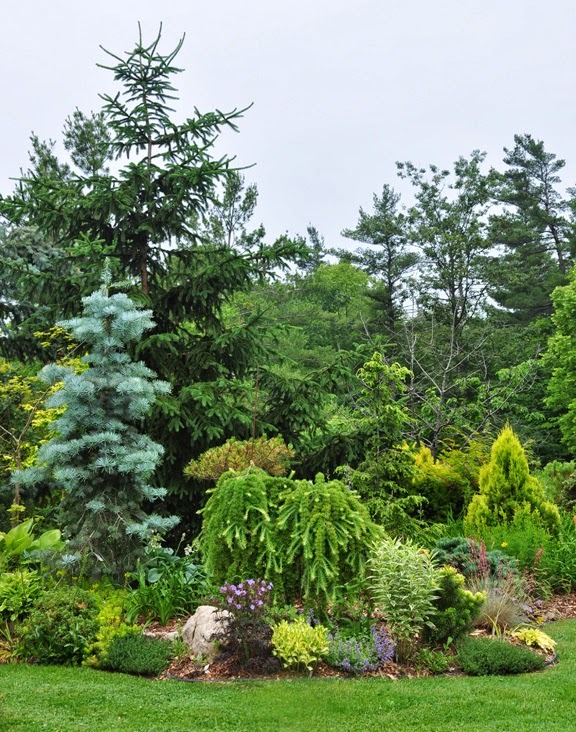 They flower would tend less noticable without the wonderful and varied backdrop of green that the conifers provide. Even though the flowers colors are all quite different in this combination of plants, they all have a purply cast that makes the grouping cohesive. Geranium 'Rozanne': Height: 30-50 cm, Spread: 45-60 cm. Full sun to part shade. Normal, sandy or clay soil are fine. Average to moist soil. 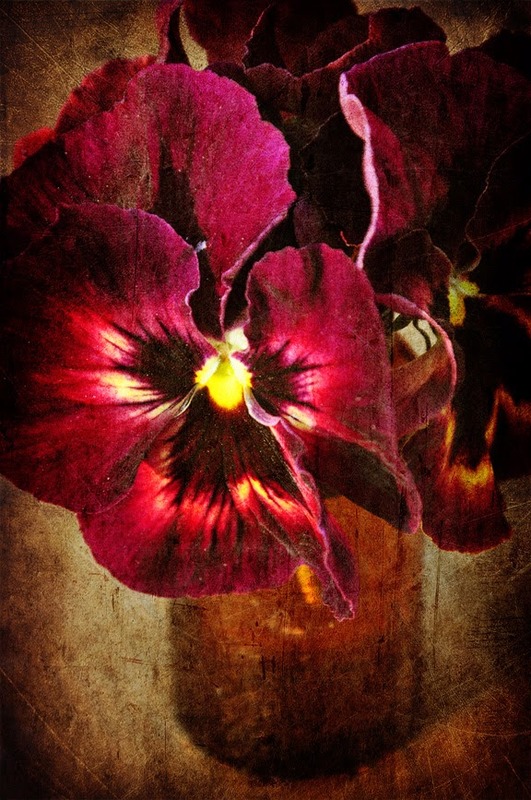 Chen says, "I have had this Geranium for years. It is a reliable and forgiving beauty." 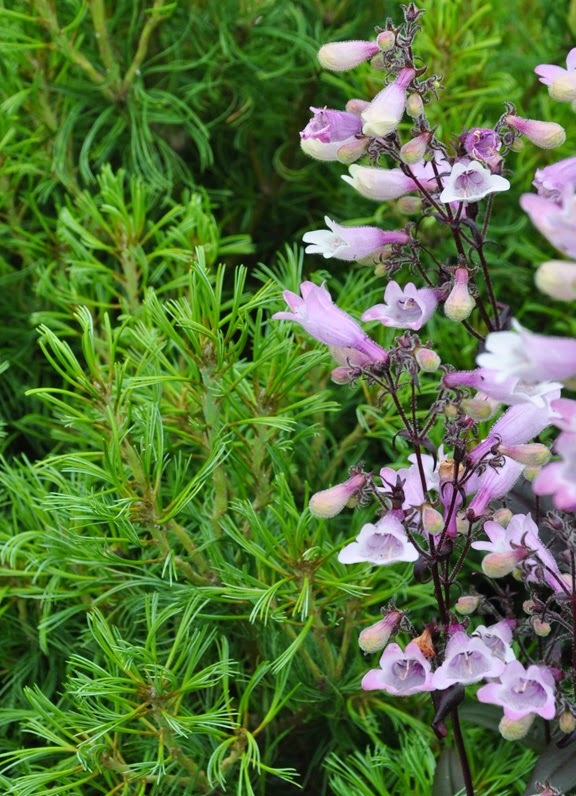 Chen Notes: " I like its pale pink flowers and nice green foliage for the front of borders. It spreads fast, bordering on weedy." 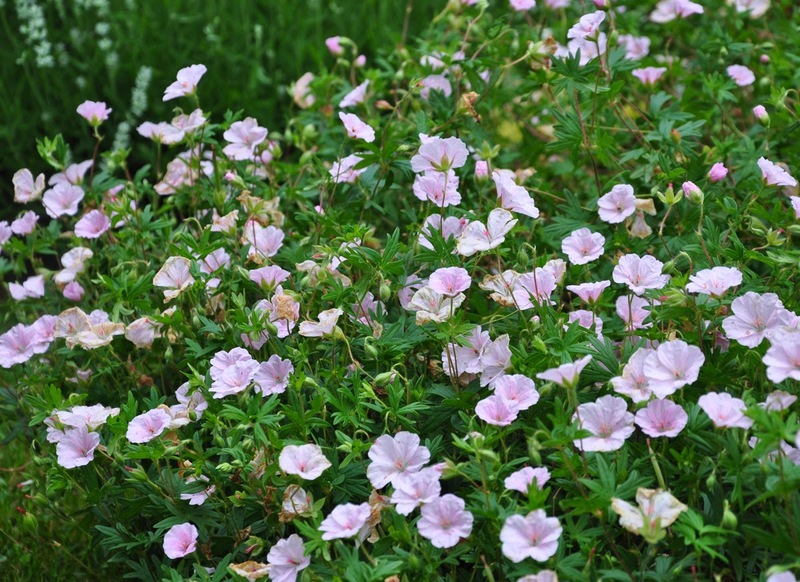 Plant Combination: Pale pink Geranium sanguineum var. striatum and Lavender, Lavandula. Why this works: Delicate and pretty in combination is always charming. "This is one of the 'must have' perennials in my garden. I grow them for their ornamental foliage and flowers, and for their easily controlled, neat habit. Most of the Lavandula in my garden are from seeds I sowed many years ago. They self-sow a little, but not enough." 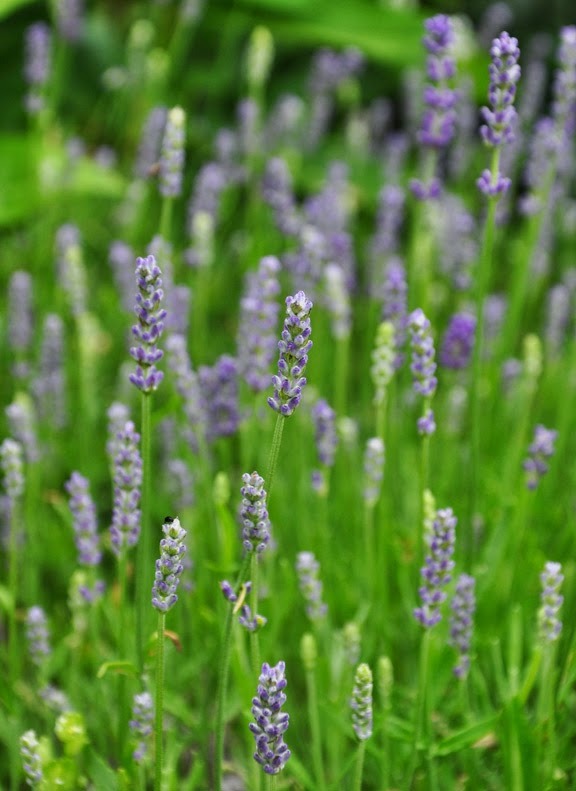 "The only thing I pay attention to for Lavandula are: not to locate them in a wet spot, give them as much light as possible and a pruning to keep a tidy shape. I do not have any special soil preparation for them. In fact, they seem to do equally well in poor soil. 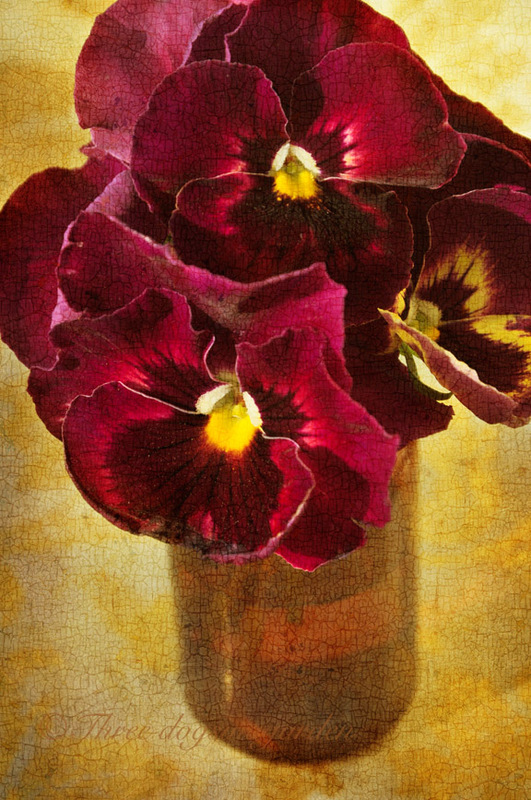 Some of them have even self-sown in the crevices of standing rocks." 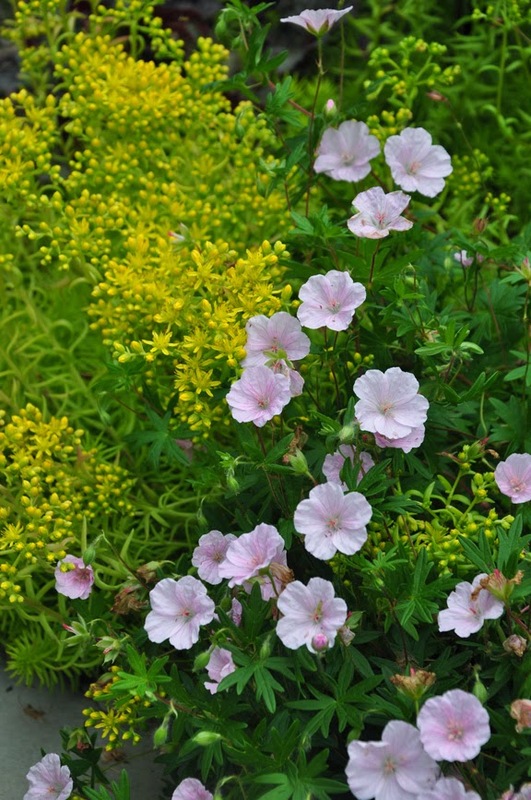 Plant Combination: Another mix using Pale pink Geranium sanguineum var. striatum. Here it is combined with ground cover Sedum rupestre 'Angelina'. 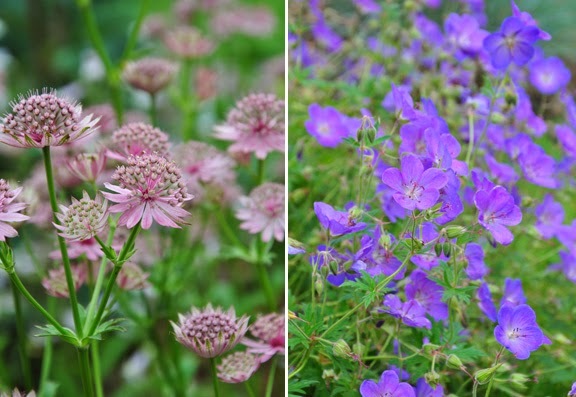 Plant pairing: Chen combines his Astrantia major 'Roma' with a Japanese Iris and purple Geranium 'Rozanne'. See a picture of the mix of all three plants on Chen's website. 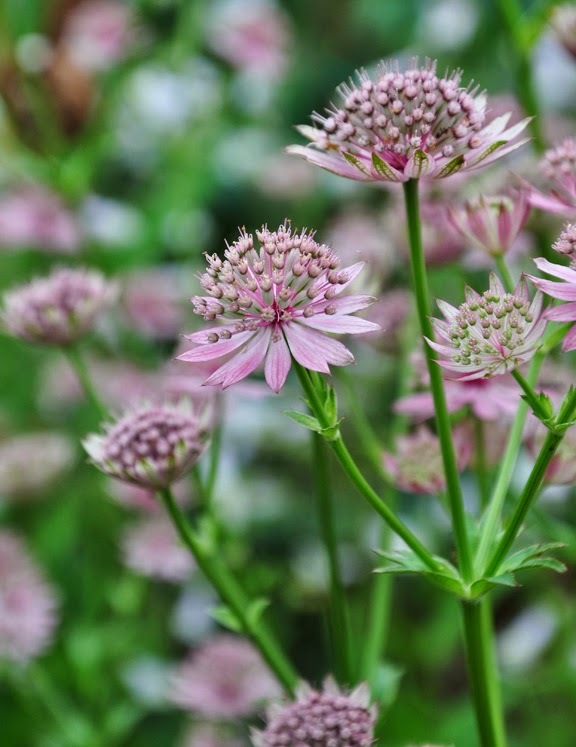 In Chen's garden, a problem with voles means he has to struggle to keep his Astrantia flourishing. This area of the garden gets morning sun and passes into shade mid-afernoon. "This is a lovely giant perennial. I am fortunate to have enough room in my garden to accommodate it. 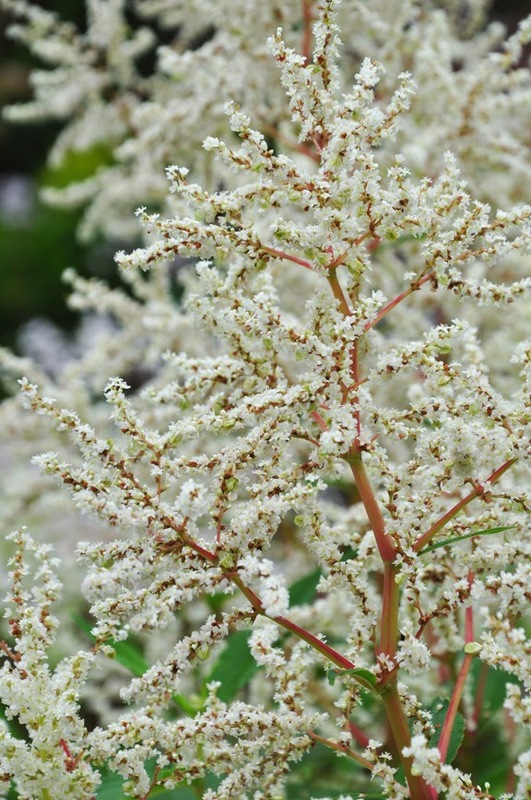 It is used as a bold structure plant and has attractive creamy-white plumes that bloom for a long time from late spring." 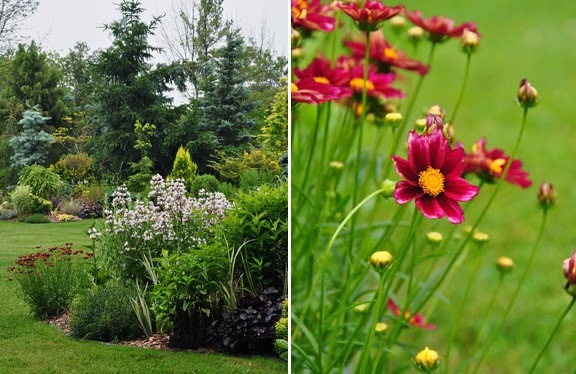 Plant Pairing: Coreopsis 'Mercury Rising' and Penstemon 'Husker's Red'. 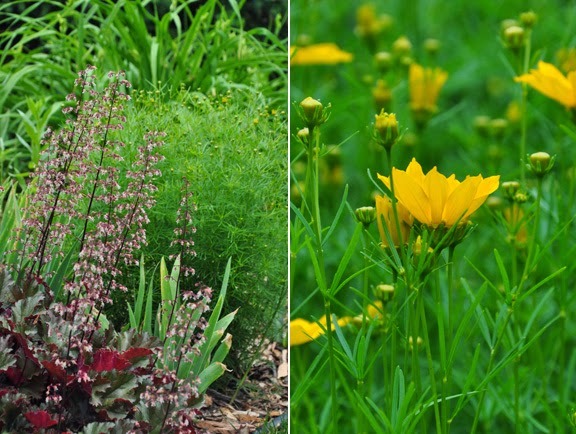 You can see Coreopsis 'Mercury Rising' in the foreground on the left. The front of a border is a perfect place for it. 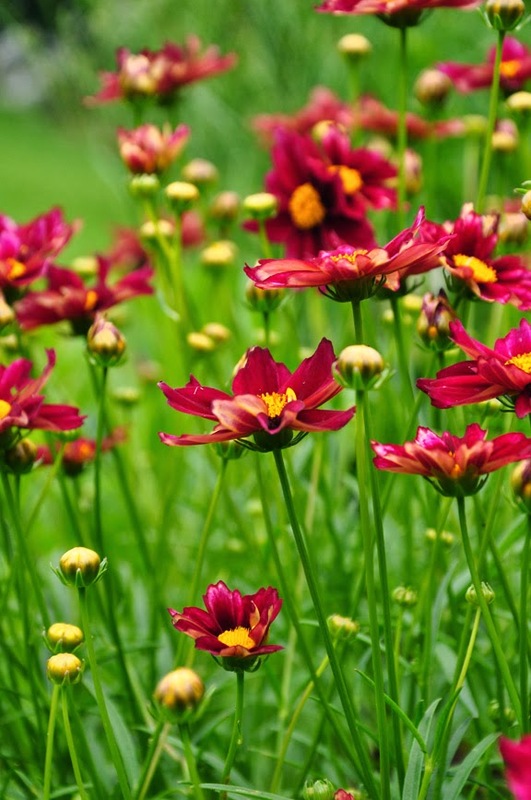 Coreopsis 'Mercury Rising': Height: 30-45 cm, Spread: 30-45 cm. Full sun. Tolerates a range of conditions: dry to average and moist soil. Zones: The jury is still out on the true hardiness of this cultivar. 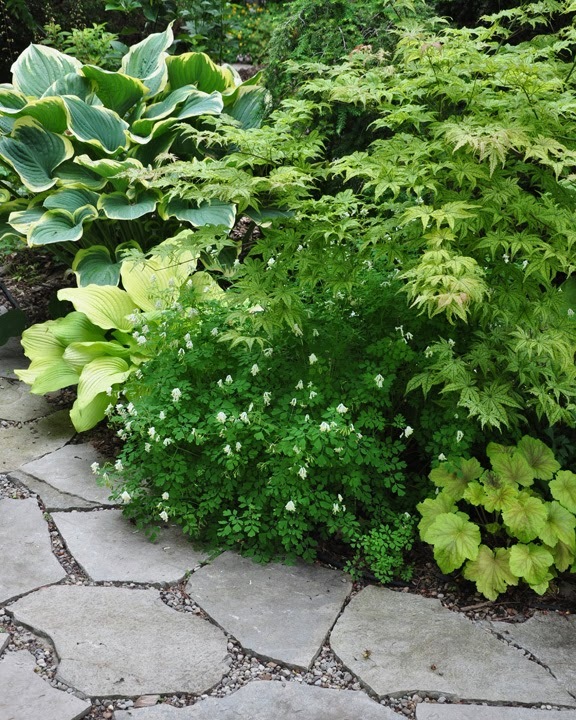 Why this works: The soft cloud of ferny Coreopsis verticillata makes a nice backdrop for the wands of tiny Heuchera flowers. "I have had this for years. 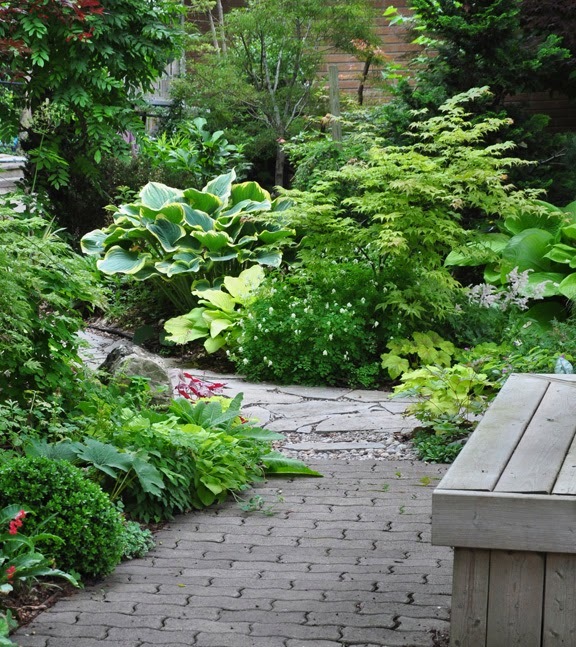 I don't particularly like the yellow flowers, but the ferny, refreshing green foliage makes it worth having around." 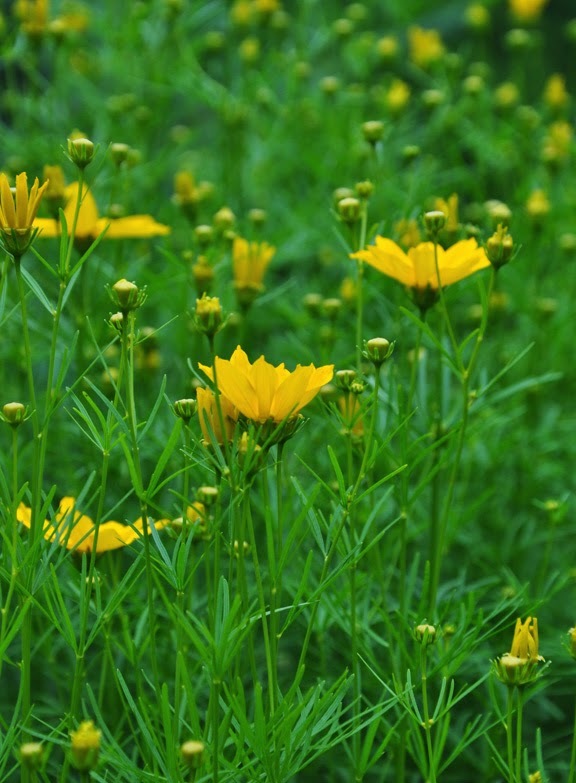 Coreopsis verticillata: Height: 30-45 cm, Spread: 30-45 cm. Full sun. Tolerates a range of conditons: dry to average and moist soil. Zones: USDA 4-9. 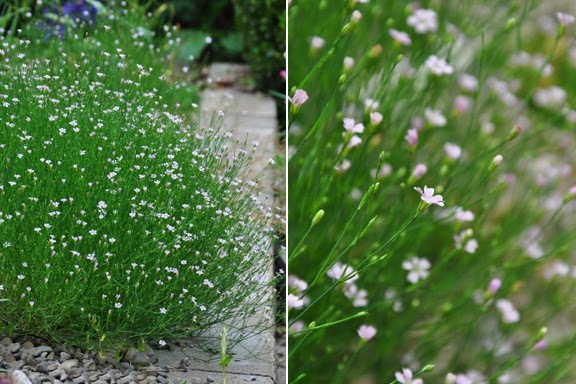 Gypsophillia cerastoides: This little pink flower caught my eye in Chen's rock garden. On his website, he warns that it self-sows to the point of being weedy. It sure is pretty though! Chen notes,"This flower color is a little too bright to mix easily with other plants. The silvery foliage is what I want. It self-sows quite a bit, bordering on weedy." 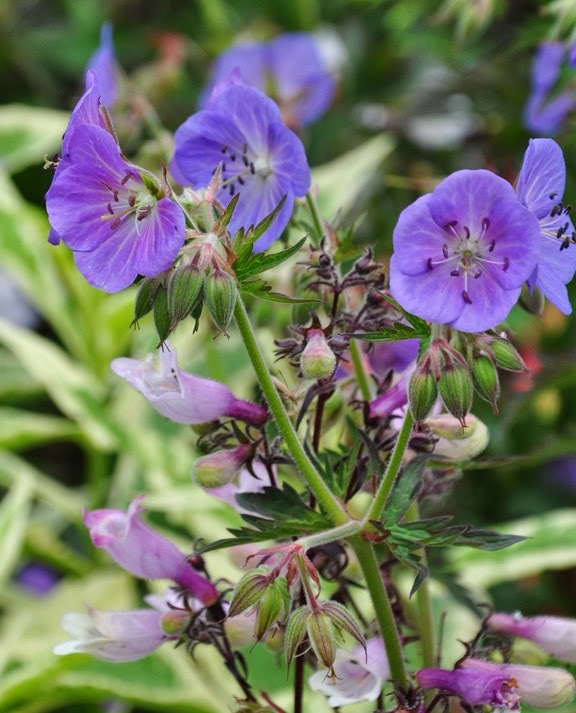 "The 'Dragon's Head' is an interesting group of perennials with various shades of attractive bluish flowers. 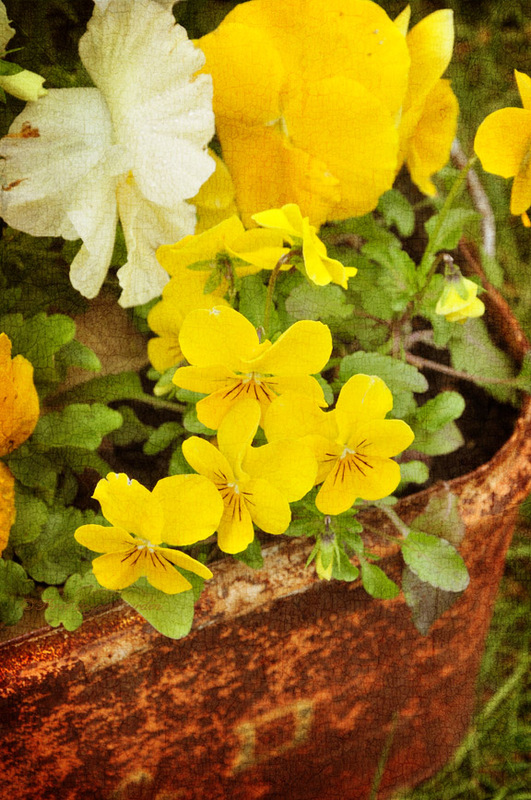 It is most commonly grown by rock gardeners. Some books have warned that this is a highly invasive group of plants. It is my belief that only some of Dracocephalums behave badly." See Chen's collection of Dracoephalum and read his full notes here. 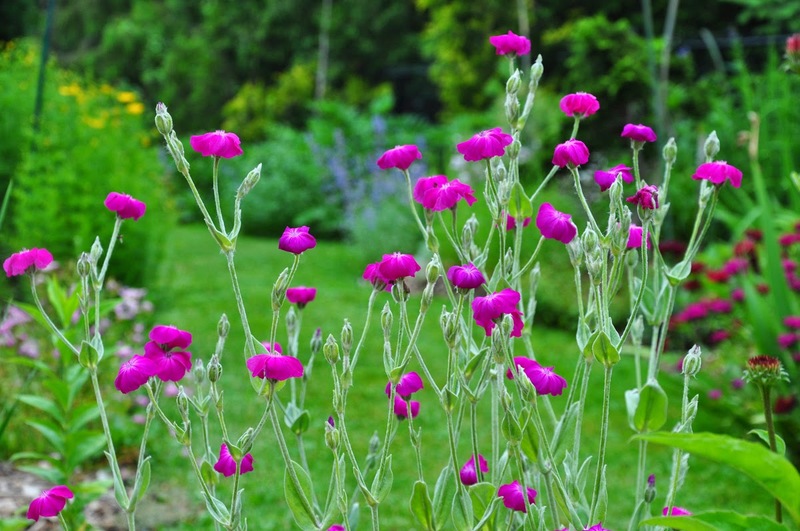 Dianthus propagates from seeds and grows easily. Although they produce tons of seeds each season, so far, I find that they mostly self-sow in their own little patch and do not run around wildly like Forget-Me-Nots. I find the taller varieties have floppy habits. All my Dianthus look like brown patches in late summer. You can easily do a clean-up by pruning off the brown tops, but if you want some self-sown babies, you need to save some for seeds. If you are willing to address these shortcomings in your composition and maintenance schedule, Dianthus belongs in your garden." 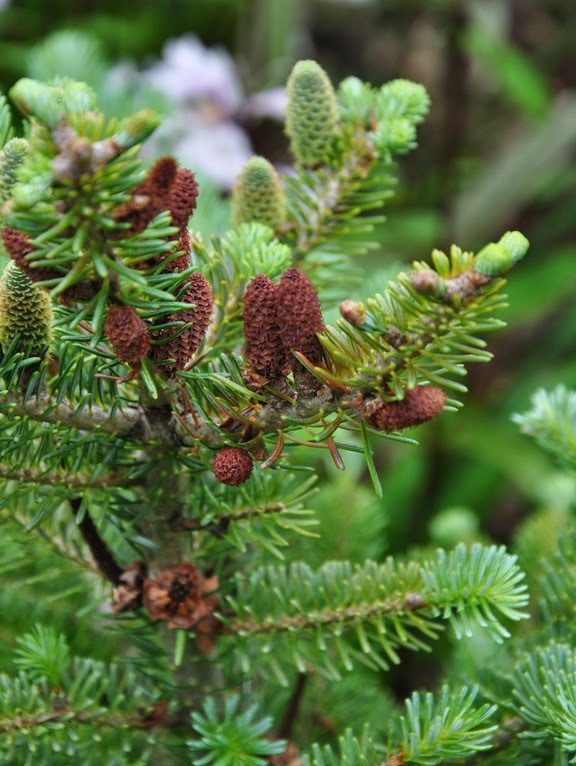 In the final post on Chen's garden we will look at his impressive collection of conifers and see how he has combined them beautifully with other plants. 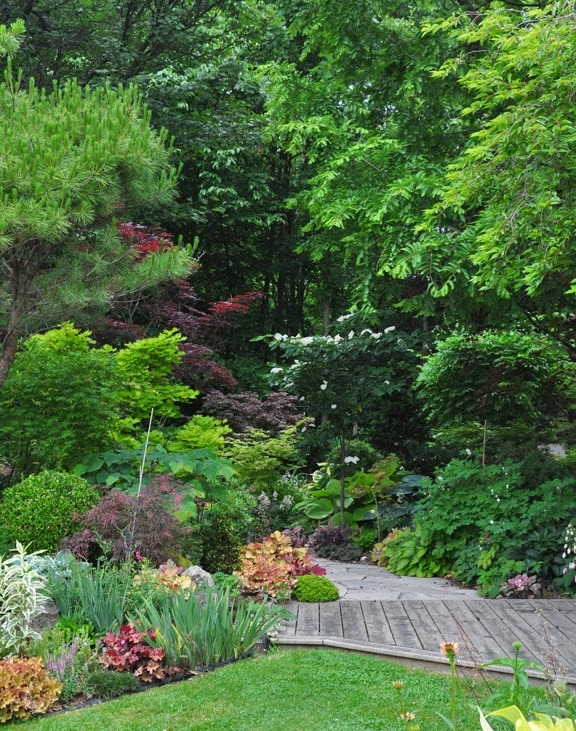 Throughout the garden, and especially along its outer perimeter, mature trees cast pockets of the Chen and Linda's magnificent garden called 'Garden Canadensis' into shade and part shade. 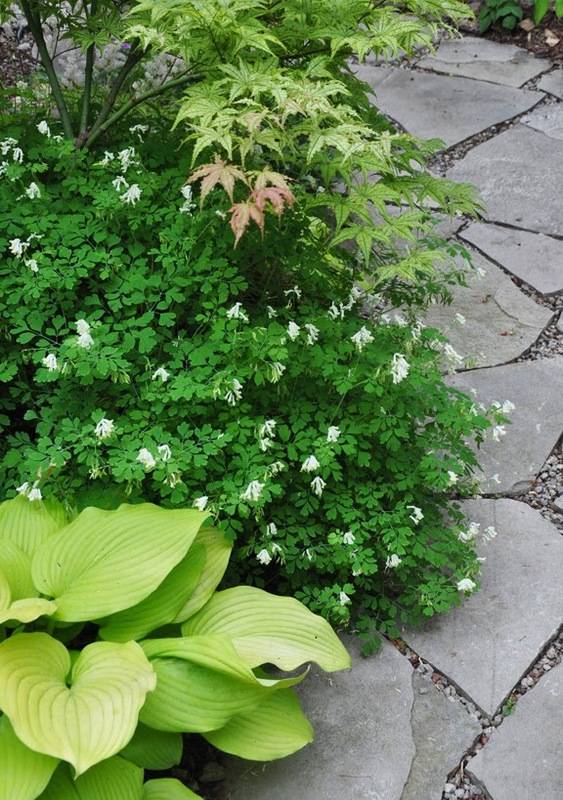 What I think will surprise and delight you is just how vibrant shady areas in a garden can be. 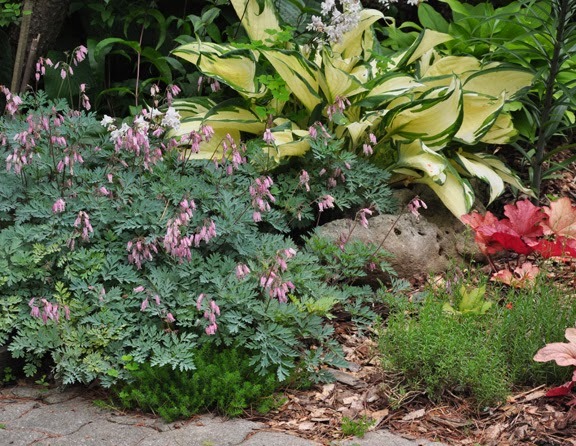 Here then are some of the many wonderful plant parings from Garden Canadensis for shade/part shade, with a brief explanation of why each combination works, as well as a bit of information on a key perennial in each grouping. 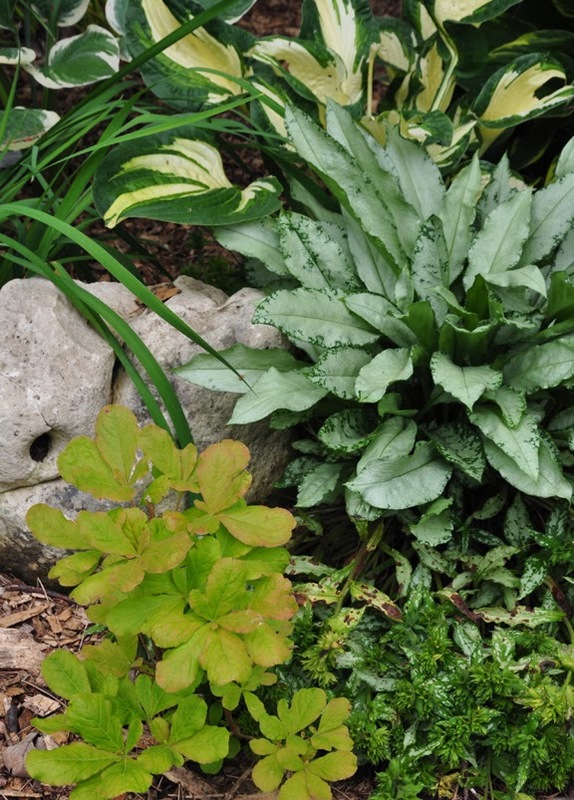 What's nice about this mix is the combination of fern-like foliage and the large, broad leaves of the hosta. "I like all Dicentras, the fern-like leaves and the dainty flowers, and would like to have all varieties if I can, eventually. Ideally, I try to plant them in the shade of some trees with enough sunlight for decent blooms, but not so much that their leaves deteriorate too quickly into summer." Dicentra 'Stuart Boothman' which is pictured above and has pale pink flowers and greyish foliage. Dicentra 'Aurora' A good reliable creamy white dwarf Dicentra. Dicenta 'Bleeding Hearts' Chen writes, "This is probably the most showy Dicentra, although it is not vigorous in my garden. I have lost 2 trials mostly because of vole problems." Plant Combination: Brunnera 'Jack Frost' (left) with Heuchera 'Silver Scroll' (in the foreground) and Hosta 'Fire and Ice' (in the upper right). What's nice about this combination: Both the Brunnera and the Heuchera have silver foliage, but they couldn't be more different or more complimentary. The cream of the hosta's foliage adds that all important element of contrast. Plant Combination: On the right is Pulmonaria longifolia 'Diana Clare' and to the bottom left is a deciduous rhododendron: Rhododendron schlippenbach which the "rabbits like to chew on". 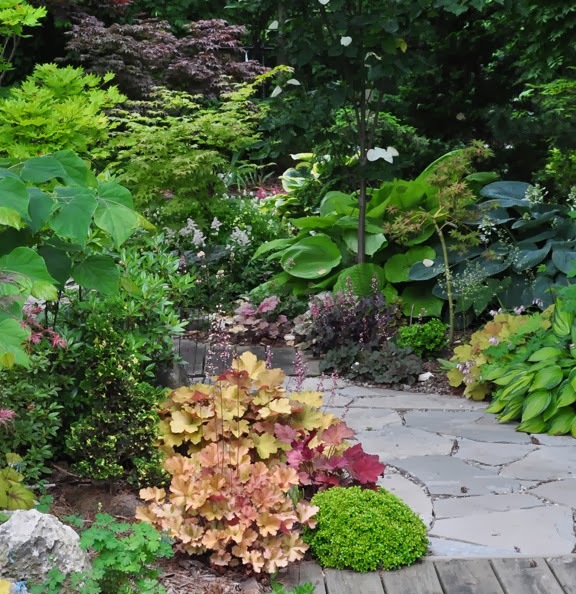 Above them is a hosta with a lots of cream trough the centre of its dark green foliage. "The quiet beauty of Pulmonarias is indispensable for the shady parts of my garden. 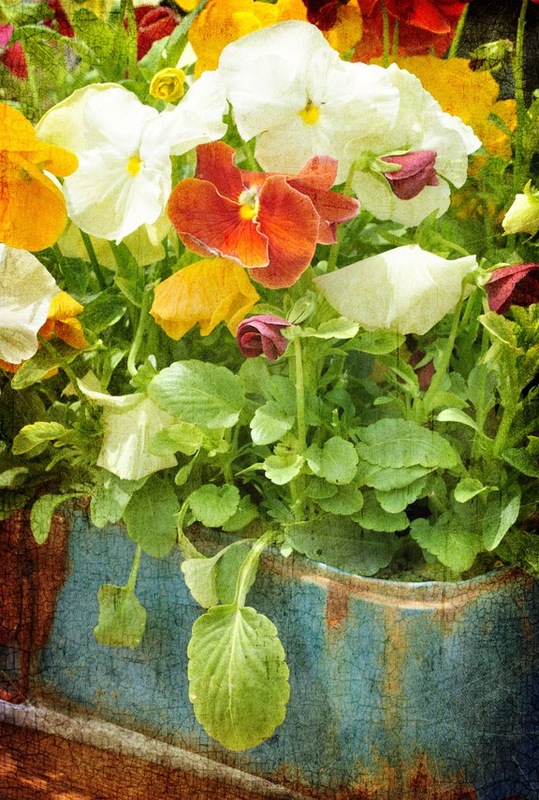 The flowers may be early and brief, but their foliage is highly ornamental from early spring into late fall. 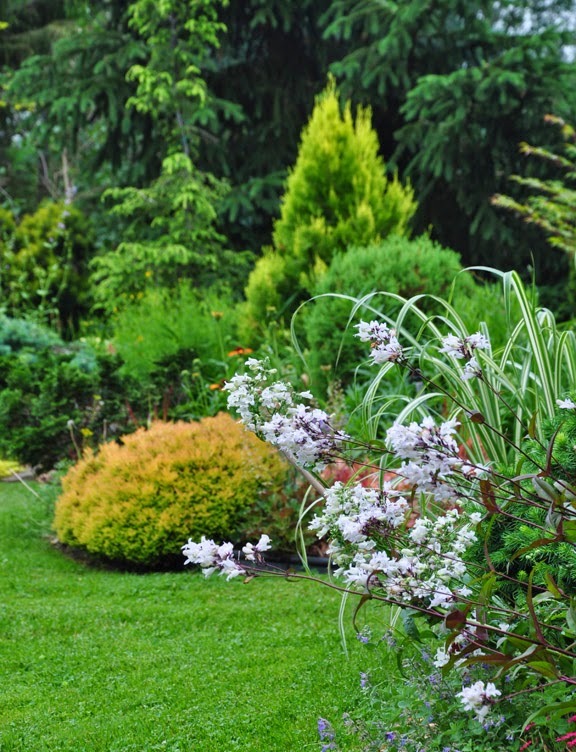 In mid-summer they typically go through a decline, but this can easily be taken care of by removing their foliage. New foliage will emerge, and be ready, as the weather is cooling off. They appear to self-sow readily (but not wildly) in my garden. This presents a problem for keeping the named cultivars intact after a few years. I suspect that many Pulmonarias on the market are just derivative seedlings of some kind. For the same reason, many name cultivars are not that distinct from each other." Pulmonaria 'Diane Clare' shown above has pale blue flowers:"Its foliage is highly ornamental for the whole season. It is a very vigorous Pulmonaria." Pulmonaria 'Opal' which has white flowers. Chen describes this variety as a "must have". Pulmonaria 'Raspberry Splash' which is a vigourous plant with showy red flowers and is "one of the best Pulmonarias". Plant Combination: Chen tells me that the neat green mound at the front of this planting is Buxus microphylla 'Kingsville'. It is "probably the most dwarf form of boxwood, and is popular to use in bonsai." 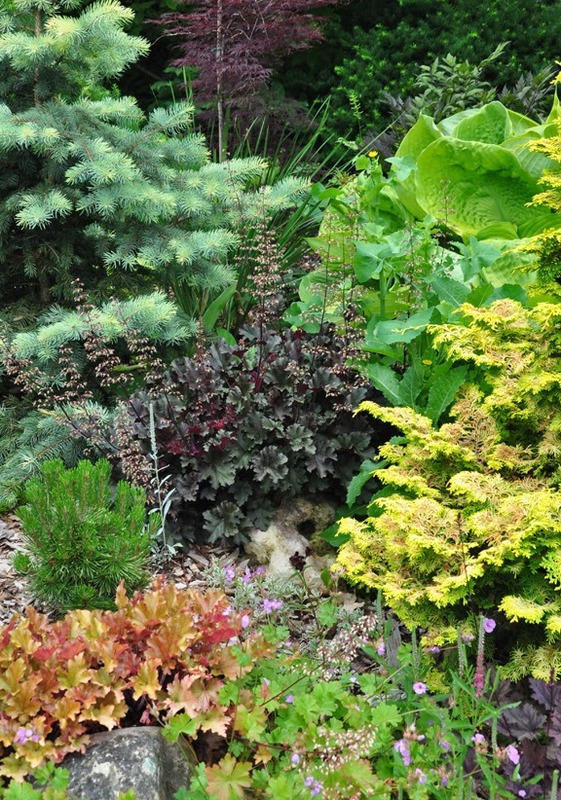 The large golden Heuchera in the centre of the picture is Heuchera 'Carmel'. 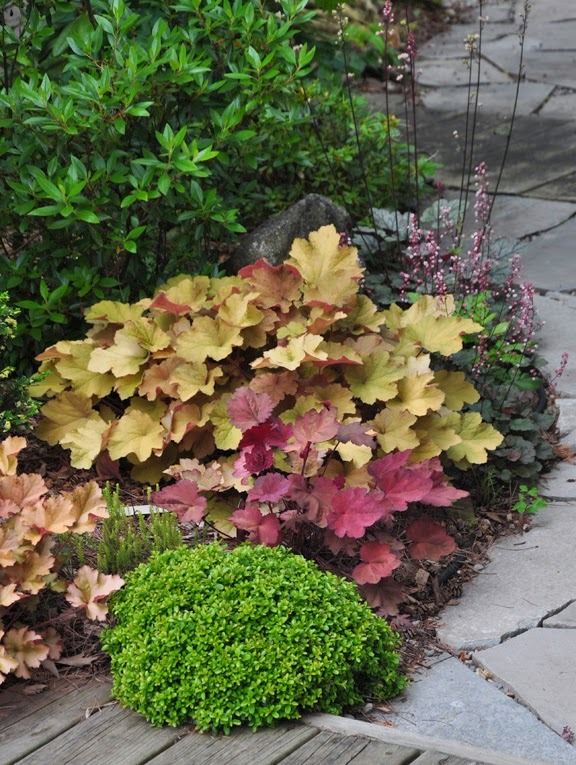 In front of 'Carmel' is what Chen describes as a"very weak, but pretty" Heuchera 'Autumn Leaves' (with reddish foliage). 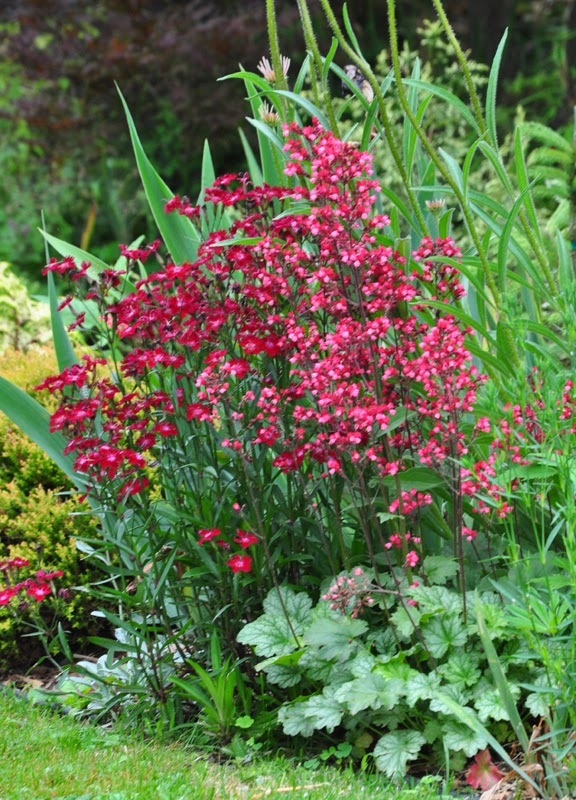 In the lower left corner is Heuchera 'Christa'. 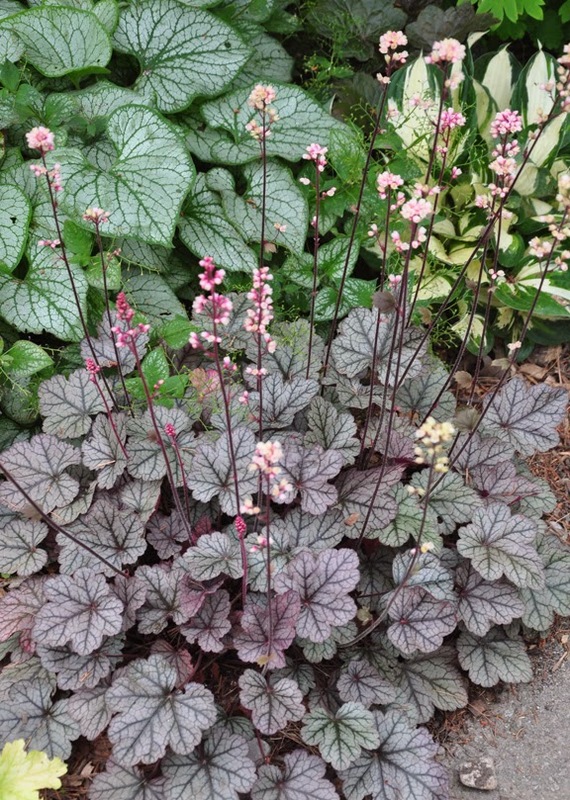 Behind 'Caramel' and to the right with the purplish-green foliage is Heuchera 'Petite Pearl Fairy'. Peaking out from behind it is the green foliage of Heuchera 'Silver Scroll'. 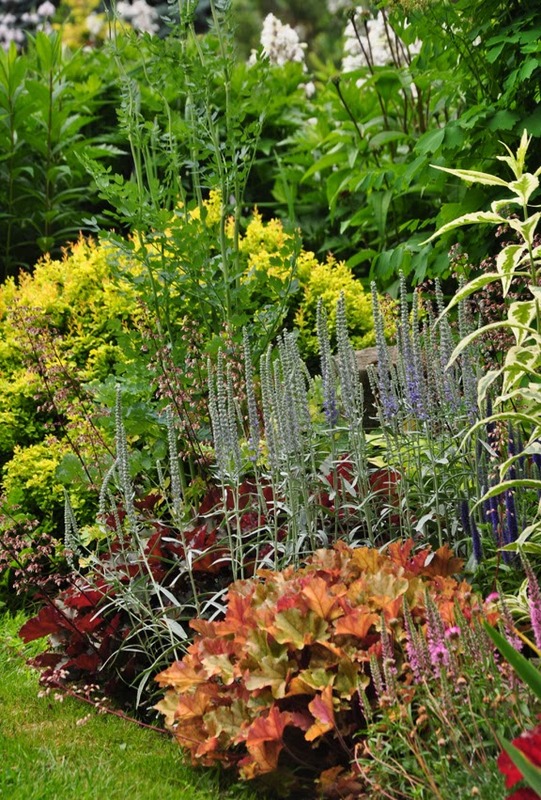 What is interesting about this planting is how multi-colored it is despite the shade conditions and minimal flowers. 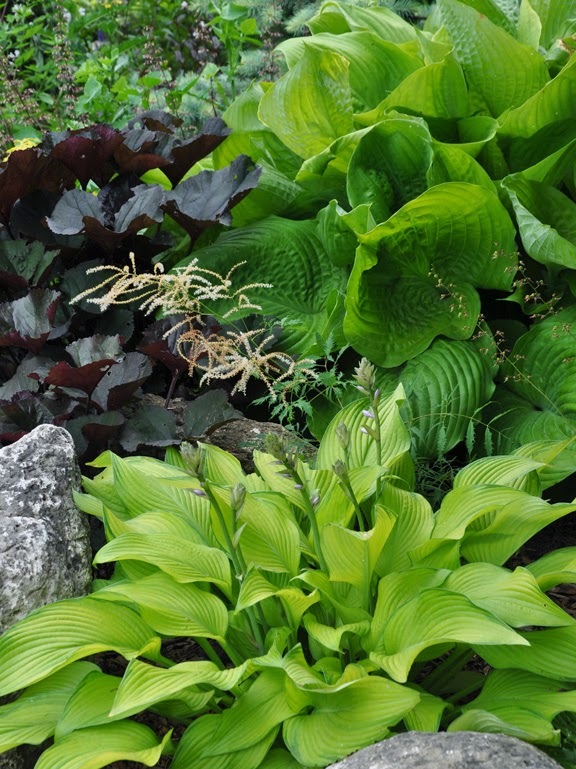 Planting Combination: On the top left is Hosta 'Sagae'. Below it is lime colored Hosta ' Blaze of Glory'. With tiny white flowers in the centre is Corydallis ochroleuca. Peaking out from the lower right is Heuchera 'Delta Dawn'. Bending over the whole group is a Japanese Maple Acer palmatum 'Peaches and Cream'. It may be primarily one color: green, but what makes this combination work is contrast. 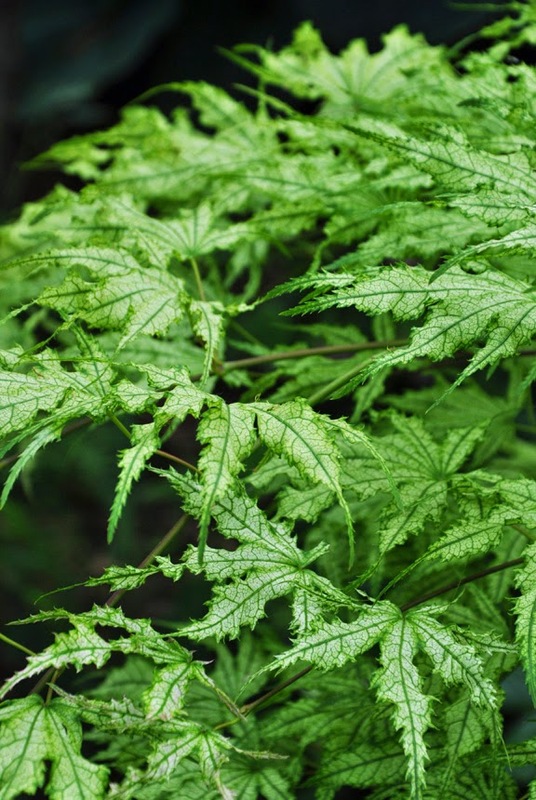 There are the cut leaves of the Japanese maple, the large leaves of the hosta and the small, dainty fern-like leaves of the Corydallis ochroleuca. Each green is distinct and mixed together they are actually quite colorful. Corydallis ochroleuca is an important filler plant for me; both for the foliage and the flowers...."
Read more and see the Chen's collection of Corydallis here. says is one of his favourite maples. 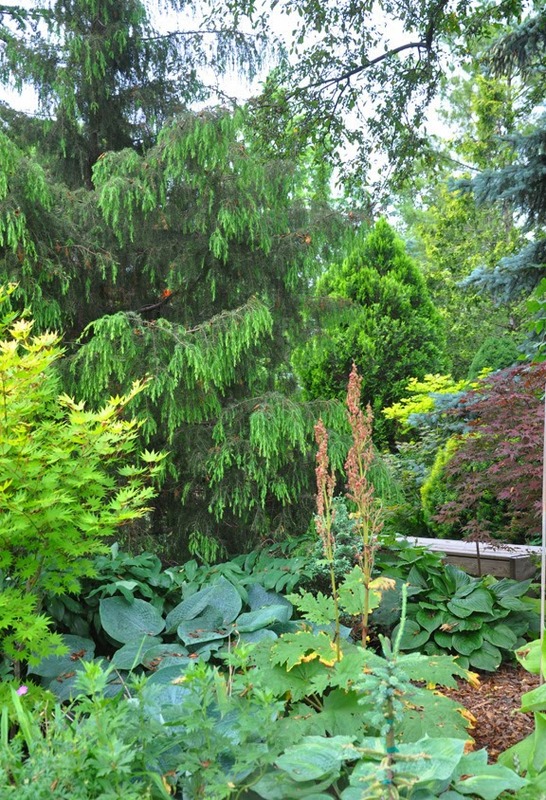 When I was going through my pictures, I came across this planting and was surprised to see hostas and conifers grouped together. I had always thought that most conifers needed sun. So I asked Chen about it. "I would estimate that this part of the bed is at least in 50% shade, if not more. Those conifers are not afraid of shade at all, especially the Alberta Spruce (I have some in very dense shade). 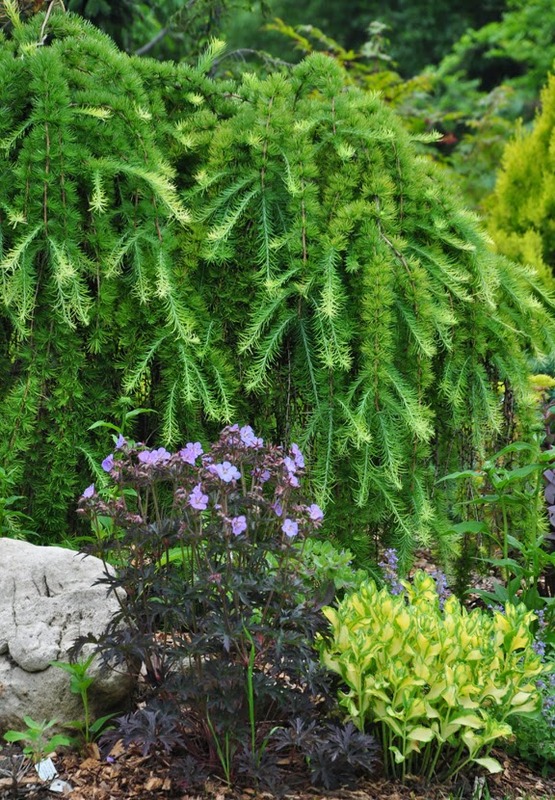 The blue conifer in the front and the bright green conifer behind it are the common Chamaecyparis pisifera 'Boulevard' and Chamaecyparis obtusa 'Gracilis' respectively. They can take full sun to a fair amount of shade. ", Chen tells me. What's nice about this combination: I love the way Chen has echoed the bluish-green color of the Chamaecyparis pisifera 'Boulevard' with the frosty, blue-green Hosta 'Regal Splendor'. The lime colored hosta in foreground is Hosta 'Silk Kimono'. The maroon foliage of the Japanese Maple makes a perfect counterpoint to all the cool greens. 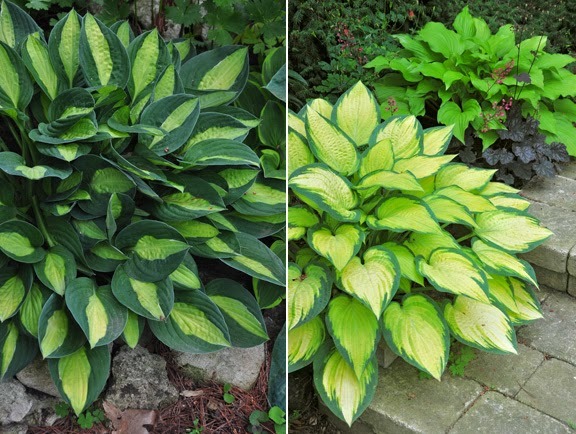 I am embarrassed to admit that I used to think hostas were kind of boring! In truth, I just hadn't seen anyone use them quite so imaginatively. 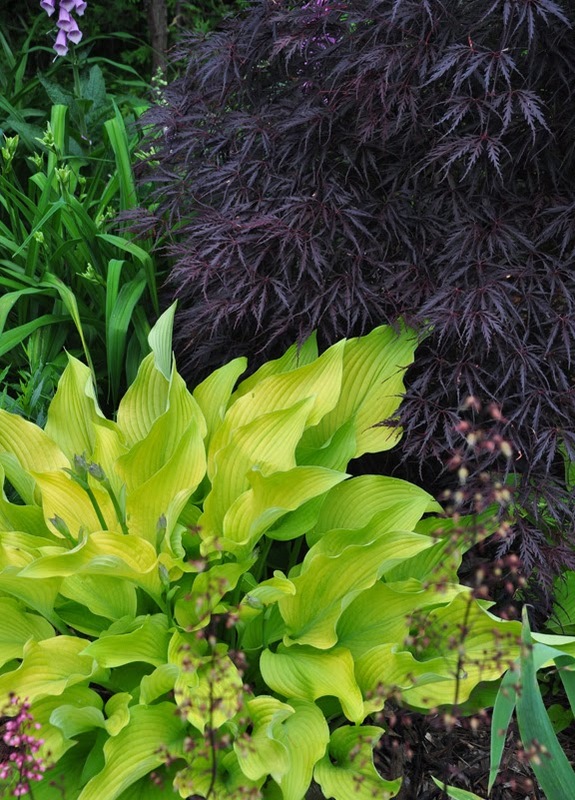 Plant combination: Hosta 'Sum and Substance' (upper right) and Hosta 'Smooth Sailing' (in the foreground) light up in contrast with the deep, dark plum leaves of Ligularia 'Britt Marie Crawford'. 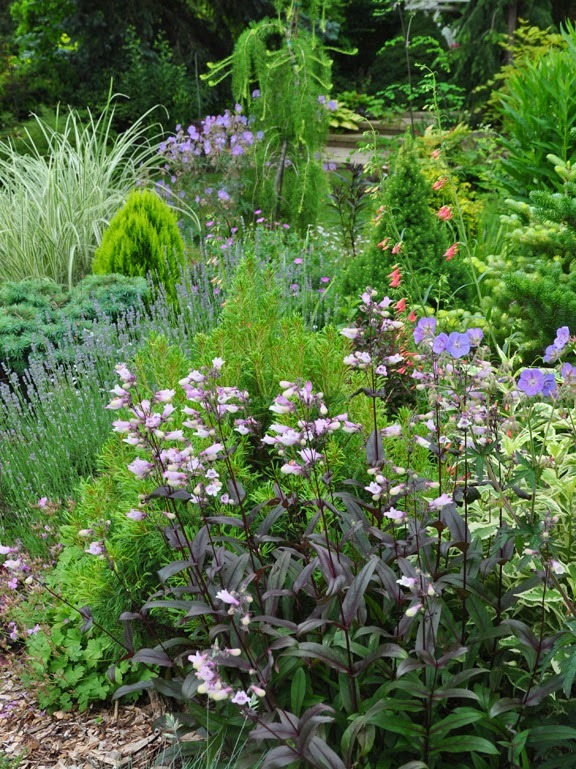 Not only is this color combination sublime, this mix of perennials offers an interesting variety of leaf shapes and sizes as well. 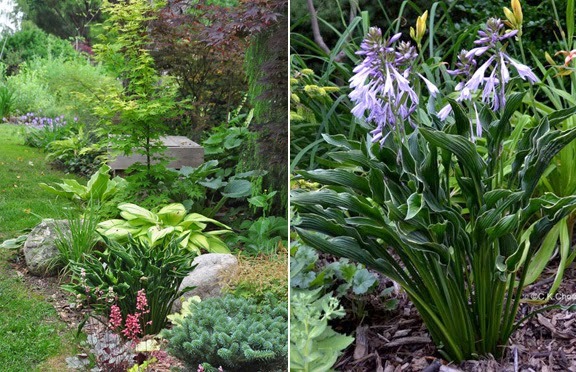 "I would think hosta is an essential perennial for the northern garden...They add an element of large leaf texture that is not prevalent in northern vegetation (in comparison with tropical environments). Depending on the variety, hosta can take full sun to full shade, and are hardy and (practically) maintenance free (except for the HVX virus). Unfortunately, it is often relatively expensive for a fair sized specimen, and takes years to develop into a nice size clump...Although I am not a Hosta addict by any means, I do like to acquire a few each year since they are so useful, elegant and take care of themselves." 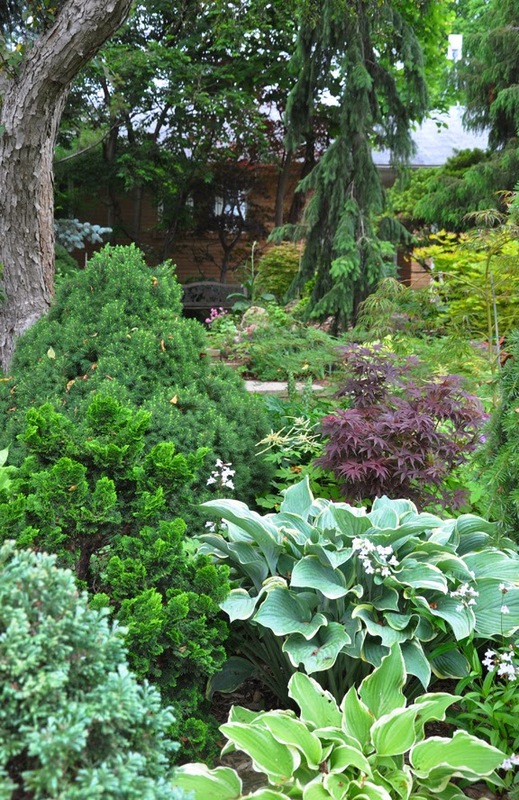 Here is another combination that includes conifers in shade conditions. Chen tells me that this area, "... only sees sunlight very early in the morning, and for a very short time at noon, when the sun passes between the large conifer, and the cover of a forty plus year old crabapple tree. 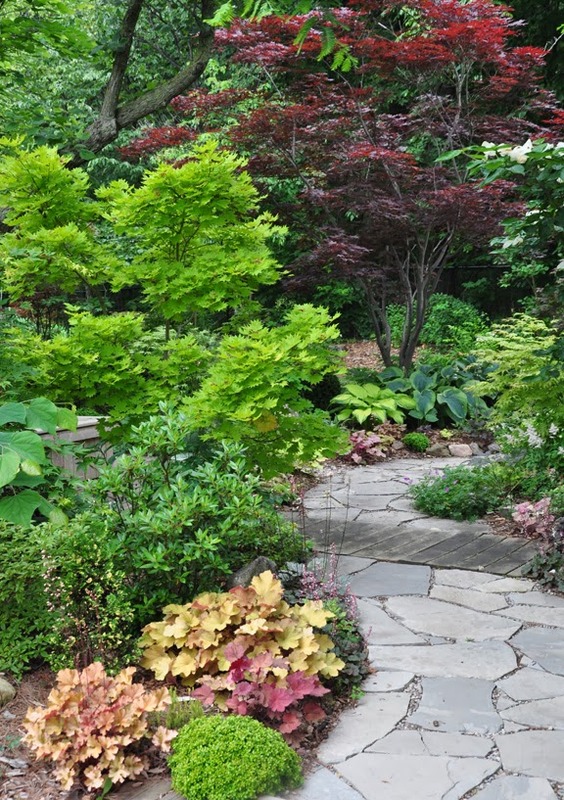 I would estimate that this part of the garden has 60% shade or more." 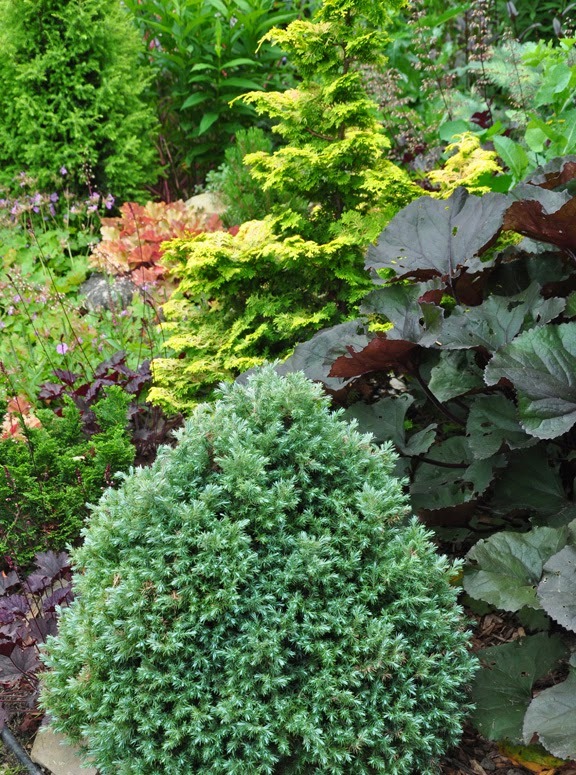 Plant combination: The light green conifer in the back is Juniperus rigida. As well as several hosta, there is a Japanese maple on the left: Acer shirasawanum 'Jordan' and the lime colored maple on the right: Acer palmatum 'Purple Ghost'. In the foreground with tall red flower spikes is Rheum palmatum 'Atrosanguineum'. 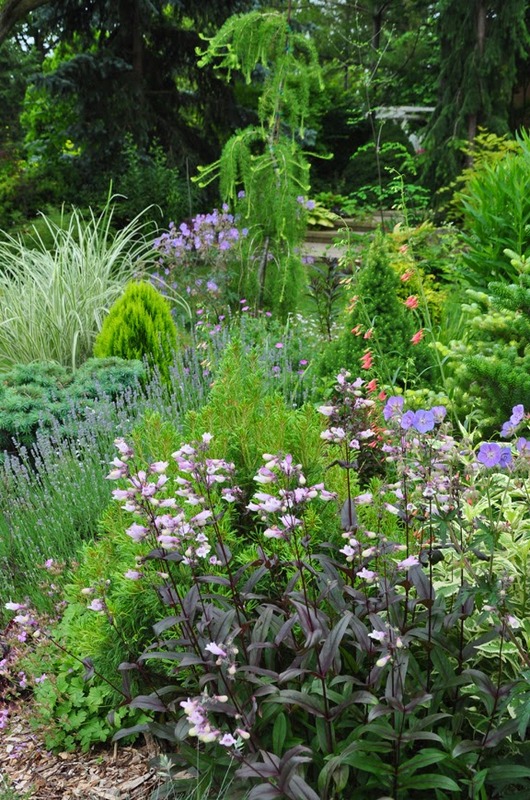 Why this combination works: Each and every plant contributes something new and appealing to the grouping. Every green is distinct and the deep maroon of the maple adds a nice punch of warm color. The mixture of scale and texture makes an area that is largely green anything, but boring. A few more examples from Chen's hosta collection. On the left is Hosta 'Gypsy Rose' and on the lower right is Hosta 'Orange Marmalade'. The lime colored hosta behind it is Hosta 'Ogon Amagi'. 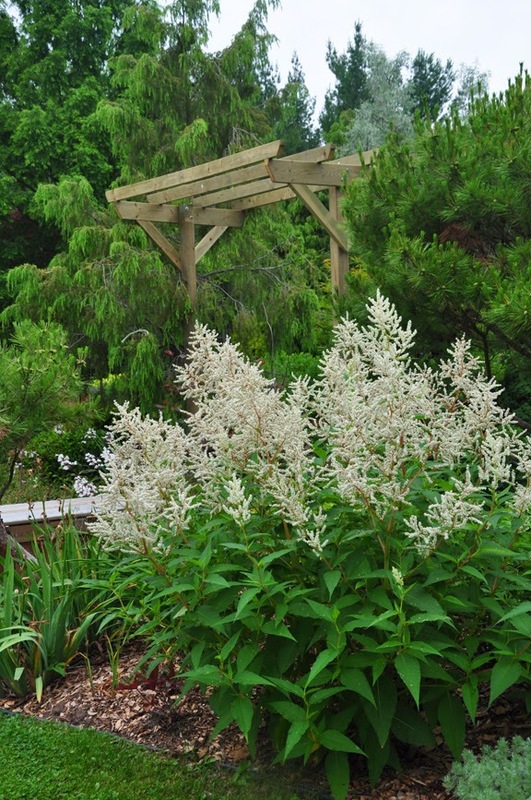 In the foreground of the righthand picture you can see a very unique hosta cultivar that has upright foliage. In the picture on the right you can see Chen's photograph of it in flower. This is Hosta 'Praying Hands'. Read more and see additional hosta pictures here. This paring is quite stunning don't you think? Plant Combination: The vivid chartreuse of Hosta 'Sun Power' practically glows in contrast with the deep maroon of the Japanese Maple, Acer palmatum 'Tamuke yama'. 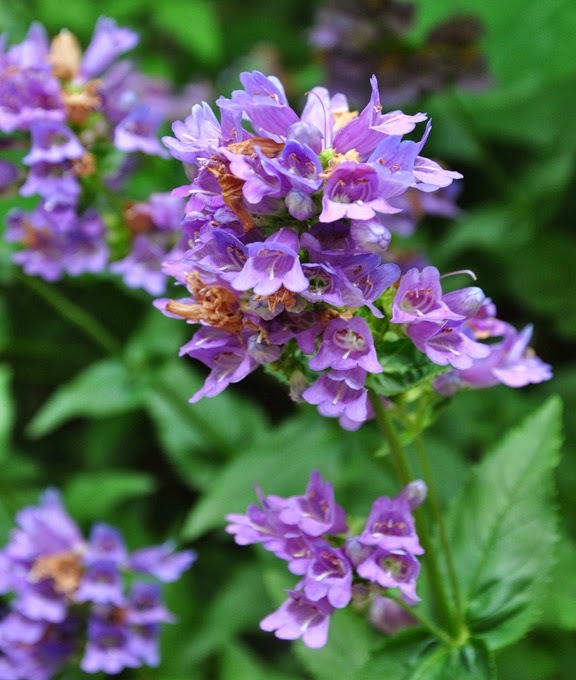 Up next will be perennials and plant combinations from 'Garden Canadensis' for sun.